An excellent addition to Canon's L-series collection of lenses, the TS-E 135mm f/4L Macro offers the outstanding optics, reliable performance and refined design, featuring the quality professionals and advanced photographers demand. Engineered to complement Canon's high-resolution camera sensors, it's poised to deliver phenomenal image quality in any number of applications. 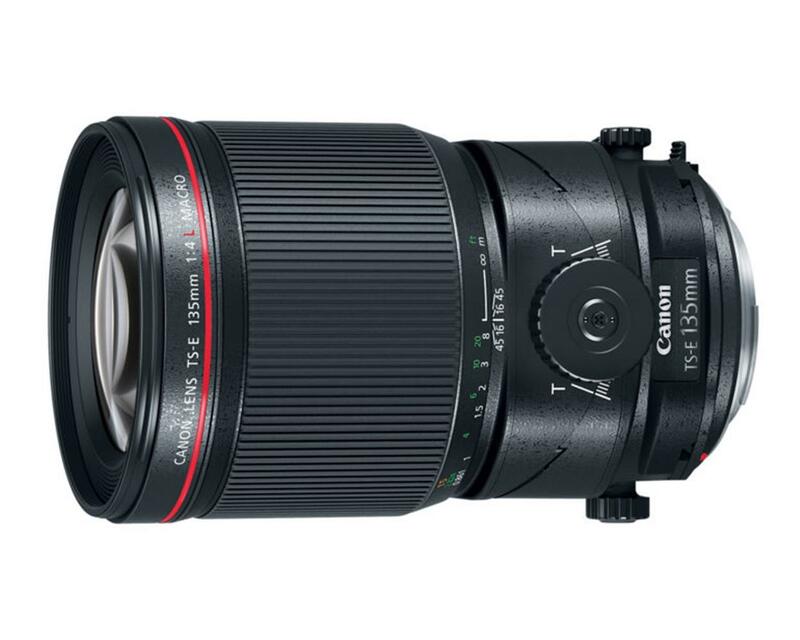 Perfect for use in the studio, the TS-E 135mm f/4L Macro's 135mm focal length enables a long working distance. This can be incredibly useful when used in tandem with lighting equipment that's set up between the subject and the camera. With its maximum magnification of 0.5x and its macro specifications, the TS-E 135mm f/4L Macro is well-suited for everything from product photography to portraiture. With a maximum aperture of f/4, the TS-E 135mm f/4L Macro delivers an optimal compromise of speed and size. Bright enough for a diverse number of applications, the f/4 maximum aperture also enables the lens to be lightweight enough for convenient use indoors, outdoors and virtually anywhere. The TS-E 135mm f/4L Macro is designed to deliver the image quality necessary for detailed, high-resolution image capture. Two UD Glass lenses in an 11-element optical formula help to minimize chromatic aberration. The TS-E 135mm f/4L Macro's optics work together to reliably deliver gorgeous, high-resolution images with sharp edge-to-edge detail. To help minimize the ghosting and flare that reflected light can cause on image capture, the TS-E 135mm f/4L Macro features Canon's SWC coating. Subwavelength Structure Coating (SWC) helps reduce flaring and ghosting caused by light hitting the lens at large angles, helping to deliver clear images with high contrast and minimal distracting glare. For greater ease of use, the TS-E 135mm f/4L Macro features enlarged knobs for fast, intuitive control of tilt and shift. Feel free to make adjustments as you please without having to take your eyes off the composition. To deliver high operability, the TS-E 135mm f/4L Macro features large tilt and shift lock knobs and a rotation lock release button. It also has a tilt-locking mechanism that keeps the lens in the zero position, helping to prevent unintended movement when in use. For great flexibility in shooting, the TS-E 135mm f/4L Macro features a tilt range of +-10 degrees to deliver a high level of control. Whether focusing on a subject not parallel to the camera's sensor, increasing or decreasing the lens's depth of field or establishing a specific plane of focus, the TS-E 135mm f/4L Macro's tilt range can prove indispensable in defining the composition. For expansive control, the TS-E 135mm f/4L Macro features an incredibly large shift range of +-12mm, enabling seemingly impossible image capture with ease. This range helps the TS-E 135mm f/4L Macro eliminate converging lines, reflections or nearby objects from the composition, recompose the image without moving the camera and even capture a wide angle of view through photo stitching. With a minimum focusing distance of 19 in./0.49m, the TS-E 135mm f/4L Macro is incredibly well-suited for close-up photography. Combined with its expanded range of movements, its minimum focusing distance helps make sharp and detailed close-up images with specifically defined depth of field a reality.